If you are an outdoor lover and you have a habit of staying prepared at all the times then this umbrella is for you! Its fabric, glass ribs and everything make it durable and ever-lasting. You can hiking or walking with the trekking poles and at the same time, enjoy your umbrella you do not have to wait for the rainy or sunny day as this is an all-wather accessory for you! 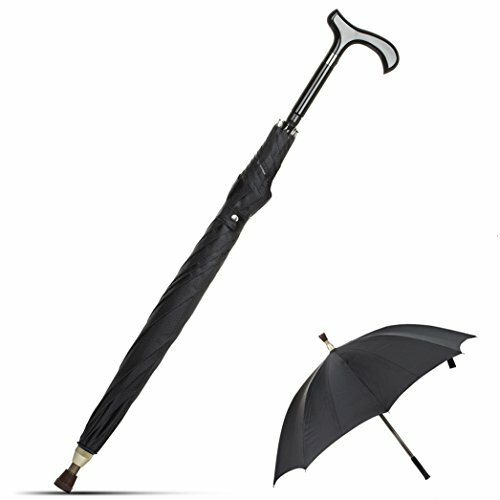 The KRY Tungsten Steel Separable Walking Stick slides out of the shaft of the umbrella so you can use both at the same time... very clever! ★SOILD - The umbrella are machine-made with fiberglass and polyamide, as strong as a steel pipe but weighs only 1 lb. 9.2oz. ★RUBBER FERRULE - the rubber ferrule is located at the base of the walking stick, which helps to stabilize the stick using on the slick pavement or against the solid ground. ★SOFT-FEEL CRUTCH HANDLE - Its handle is comfortable to hold onto. This will help reduce the strain of having to hold up an umbrella for any length of time, and which is also designed to bear more weight. If you have any questions about this product by KRY, contact us by completing and submitting the form below. If you are looking for a specif part number, please include it with your message.